So we are about half way through the gardening year. Early and Mid spring crops like Spinach, peas and lettuce are gone, early summer crops like potatoes, beets, and carrots (as well as Hoop House peppers!) are harvestable. Tomatoes are heavy on the vine but still green, corn is 4-5′ tall and starting to tassle, fall squash are sending their unruly vines through the paths, and onions are bulbing. Fall crops are being planted in flats -kale, spinach, and lettuce #4 to refill holes in the potato patch and other areas. With a breif respite from chores, its time to document some of my reflections. To a row, our direct seeded crops have failed. Our market garden plot is a 9 mile drive from our house. That means that I am really only up there once a week for any appreciable time. While the main culprit for this was the 15 inches of rain we got in a 10 day period in June, but even in a “normal” year (haven’t seen one yet) I know the weeding would have gotten away from us. In freshly plowed ground like we started with, carrots, beets, bush beans, onions, and direct seeded lettuce will all be out competed by weeds without almost daily attention the first several weeks. Some rows have been inundated with a perrenial, rhizomatous sedge, but our main problem is super vigorous annual weeds: amaranth, lambs quater, button weed, and thistle mostly. Left unattended these will all crest at over 5′ tall, and in a week they easily get bigger than any growth carrots can put on. My biggest learnings here are that I will simply not even try these on fresh soil again. With more frequent attention mulching and/or wider row spacing would either smother many of the weeds or allow a wheel or scuffle hoe between the plants. I planted them in “wide” rows and the weeds took care of every gap I left. I was planting based on maximizing yield per row ft like I do at home, but at the farm I have all the land I need -I need to focus on ease of maintenance, to maximize yields. I am retrying carrots in the compost beds which have a fraction of the weed pressure to see if that might help. That last section was depressing… this one will be more triumphant. The same insane fertility that makes the lambsquater put on a foot a week in height does the same for equally vigorous veggies. Our potatoes, corn, fall squash, tomatoes, and cucumbers are unbelievably lush -deep green leaves, great height, and from the harvests on the potatoes at least -very productive. Even at baby stage I am seeing 1# per linear row foot of Carolas, and at full size should see 2-3#. These plants are either very aggressive in and of themselves (potatoes, squash, corn) or transplanted in at decent height (cukes, and tomatoes). In the seeded crops I have weeded about twice 2 weeks in, and again at week 4. After that they are so robust that nothing else stands a chance of causing any significant harm and I only weed to prevent them dropping seed. In the tomatoes/cukes I planted into freshly tilled soil, and the mulched. Again, they put on so much mass that little can cause them harm. This amount of work better matches the amount of effort I am able to put in. Its fabulous. I bought mine from Fed-Co and love it. Thus far I water about once a week (in the 2 times we haven’t had an inch of weekly rain). Routine is to pull into the farm, turn on the water, unload, weed, harvest, transplant, whatever for 3-4 hours, pack up, and then turn the water off. Done. Its pricey, but will last for several seasons and it has already paid for itself in time savings. I also have 2 auto timers for when the dry season gets here, I just haven’t needed them yet. Start with Big Vigorous Veggies (BVV) on fresh land if you can’t smother the weeds out first. I will never try carrots, etc on freshly tilled soil again. 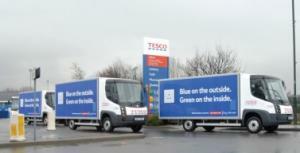 Match your plants to your time constraints. Potatoes are great crops for periodic spurts of energy in the garden. 1 Day planting. 2-3 half days weeding. 1 Day pulling beetles/spraying Bt (if needed!). Lots of little 1 hour days harvesting -and harvesting potatoes is not even remotely considered work by me! Yields will be well north of 1000#’s, with 180#’s already in the hopper in July Wk 2. Corn and Squash are about the same, with less time harvesting. Tomatoes get alot more time harvesting, but the harvest is much easier. When considering a truly Sustainable Garden -time needs to be factored as an input just as much as water and nutrients. Time will make a garden economically unsustainable if poorly managed, and the entire garden could fail if the time inputs for various crops are not considered wisely. I am a long way off of using the Sustainable Market Garden Plan, but the idea is still sound. Incorporating these learnings will only make it better. While there have certainly been some disappointments this year, being able to pull out bushels and bushels of potatoes with so little input is making up for it in a BIG way! Other things still to work out -these gardens are not “permacultured” yet, and are still very “problem” intensive when compared to Fukuoka’s Natural Farming (the problem of weeds, the problem of plowing, the problem of fertilizer). In other words the design is messy. Need to work on that! Attracting “good bugs” to our yard is a primary design consideration in both our home permaculture gardens, and at our market gardens. Having permanent Beneifical Insect Populations and Sustainable Soil Fertility are the two main reasons I designed the, as yet untested, Sustainable Market Garden. But I am not an entimologist, so how do I know what bugs I am attracting? Very high quality photos help you identify the buggers, and put a name to them -and if the guide is short on text it will at least allow you to have a solid idea of what is in your gardens, which will allow you to go back an ddo more research. Here at One Straw we love potatoes. In fact I have an inordinate affection for the entire solanacea family which makes my rotations difficult in the garden, but that is another post. This year we went Big Time and planted 1000 row feet of potatoes from about 200#’s of seed stock from local growers and FedCo. The beds they went into were pure finished compost on a permaculture farm north of here. I had concerns about planting a monoculture block that large, we didn’t test the soil so I had concerns about that too -it was all leaf mulch compost -would it be deficient in nitrogen? minerals? But with time pressing in we jumped in and winged it. I will try to get some pics up soon from the fields, but suffice it to say that many of the Carola plants are over waist high! Better yet, the MASSIVE rains here in the upper midwest seem to have completely obliterated the Colorado Potato Beetles on the property. I have used essentially ZERO inputs on the planting -no BT, no fertilizer, no amendments, and only irrigated one day thus far in 60. Is it working? The pic at right should answer that question. 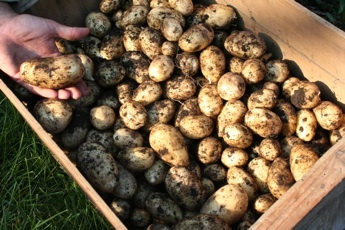 We started harvesting baby taters last week -and we are already getting 12-16oz of spuds per plant. And the largest is barely 3″ long – with another month to bulk them up 3-4# per plant may be possible. Add in the fact that I have about 700 plants left to harvest, and I think my 1-2000# harvest is doable! 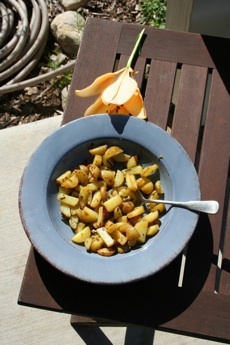 The dish pictured is about 1/3rd of a plant of baby taters, fried up with garlic scapes picked fresh, along with olive oil, rosemary and sea salt. Crap, I just drooled on the keyboard…again. The skin on the Carola’s is so delicate you can actually rub it off when you are cleaning them and they keep their firmness amazingly well in the frying pan. Delicious!